University of Illinois molecular and integrative physiology professor Rhanor Gillette and his team found that the predatory sea slug, Pleurobranchaea californica exhibits a learned avoidance behavior when confronted with another type of sea slug, Flabellina iodinea. CHAMPAIGN, Ill. - Researchers have found that a type of predatory sea slug that usually isn't picky when it comes to what it eats has more complex cognitive abilities than previously thought, allowing it to learn the warning cues of dangerous prey and thereby avoid them in the future. The research appears in the Journal of Experimental Biology. 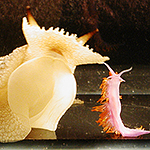 The predatory sea slug, Pleurobranchaea californica, left, shows avoidance behavior when it first confronts sea slug Flabellina iodinea. Thirty minutes later, Pleurobranchaea is shown to continue its learned avoidance behavior. This avoidance behavior is much more complex than what Pleurobranchaea, which has a simple nervous system, was thought capable of having. Pleurobranchaea californica is a deep-water species of sea slug found off the west coast of the United States. It has a relatively simple neural circuitry and set of behaviors. It is a generalist feeder, meaning, as University of Illinois professor of molecular and integrative physiology and leader of the study Rhanor Gillette put it, that members of this species "seem to try anything once." Another sea slug species, Flabellina iodinea, commonly known as the Spanish shawl because of the orange outgrowths called cerata that cover its purple back, also lives off the west coast. Unlike Pleurobranchaea, however, the Spanish shawl eats only one type of food, an animal called Eudendrium ramosum. According to Gillette, the Spanish shawl digests the Eudendrium's entire body except for its embryonic, developing stinging cells. The Spanish shawl instead transports these stinging cells to its own cerata where they mature, thereby co-opting its victim's body parts for its own defense. The story of Gillette's Pleurobranchaea-Flabellina research began with a happy accident that involved showing a lab visitor Pleurobranchaea's penchant for predation. "I had a Pleurobranchaea in a small aquarium that we were about to do a physiological experiment with, and my supplier from Monterey had just sent me these beautiful Spanish shawls," Gillette said. "So I said to the visitor, 'Would you like to see Pleurobranchaea eat another animal?'" Gillette placed the Spanish shawl into the aquarium. The Pleurobranchaea approached, smelled, and bit the purple and orange newcomer. However, the Flabellina's cerata stung the Pleurobranchaea, the Spanish shawl was rejected and left to do its typical "flamenco dance of escape," and Pleurobranchaea also managed to escape with an avoidance turn. Some minutes later, his curiosity piqued, Gillette placed the Spanish shawl back into the aquarium with the Pleurobranchaea. Rather than try to eat the Spanish shawl a second time, the Pleurobranchaea immediately started its avoidance turn. "I had never seen that before! We began testing them and found that they were learning the odor of the Spanish shawl very specifically and selectively," Gillette said. Gillette and his team later replicated that day's events by placing a Pleurobranchaea in a training arena 12-15 centimeters from a Spanish shawl, then recorded the Pleurobranchaea's behavior. They returned the Pleurobranchaea to the arena for four more trials in 20-minute intervals, then repeated the procedure 24 and 72 hours later. In the experiments, those Pleurobranchaea whose feeding thresholds were too high (meaning they were already full) or too low (they were extremely hungry) would either not participate or completely consume the Spanish shawl, respectively. Those that were hungry, but not ravenously so, continued to exhibit the avoidance-turn behavior when placed with the Spanish shawl even 72 hours later. 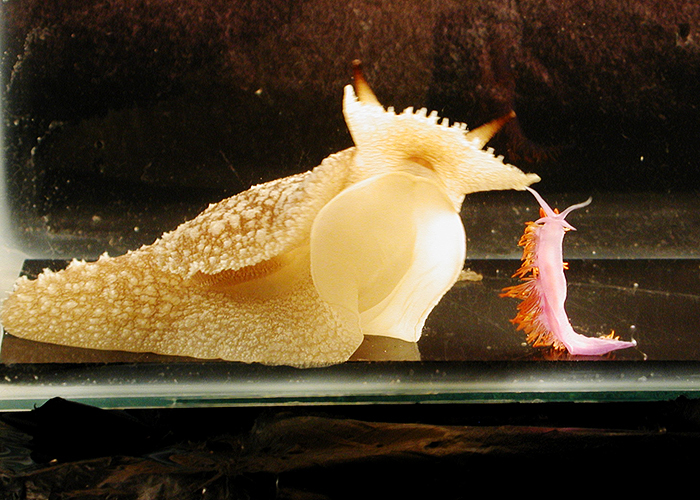 This showed that Pleurobranchaea was selective in its food choices, but only on a case-by-case basis; the sea slugs already trained to avoid the Spanish shawl would readily eat a species closely related to Flabellina called Hermissenda crassicornis. Such behaviors come in handy in Pleurobranchaea's natural environment, Gillette said. "If you're a generalist like Pleurobranchaea, it's highly strategic and advantageous to learn what's good and what's not good so you can decide whether or not to take the risk or of attacking certain types of prey," he said. These findings show that the "simple" Pleurobranchaea is much more complex than originally thought. 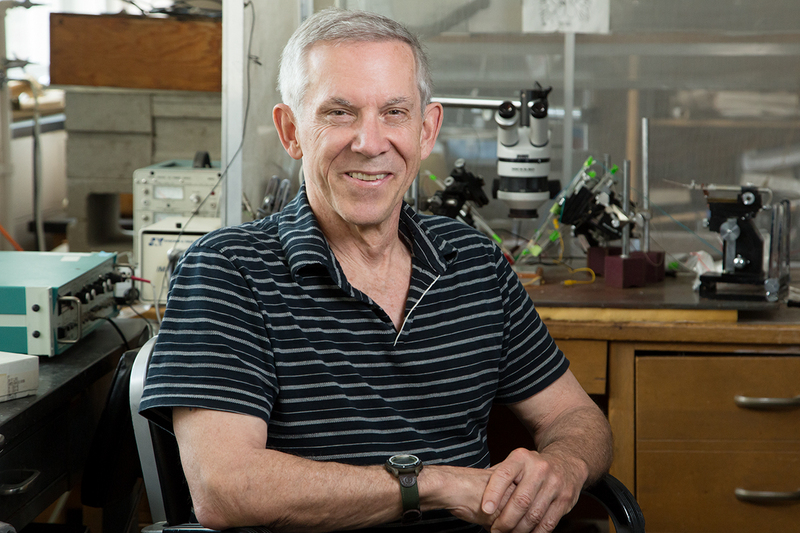 "We already knew the neuronal circuitry that mediates this kind of decision," Gillette said. "Finding this highly selective type of learning enlarges our perspective of function, in terms of the animal's ability to make cost-benefit decisions that place it on a rather higher plane of cognitive ability than previously thought for many sea slugs." To reach Rhanor Gillette, call 217- 333-0328; email rhanor@life.illinois.edu. The paper, “Selective prey avoidance learning in the predatory sea-slug Pleurobranchaea californica,” is available online or from the U. of I. News Bureau.